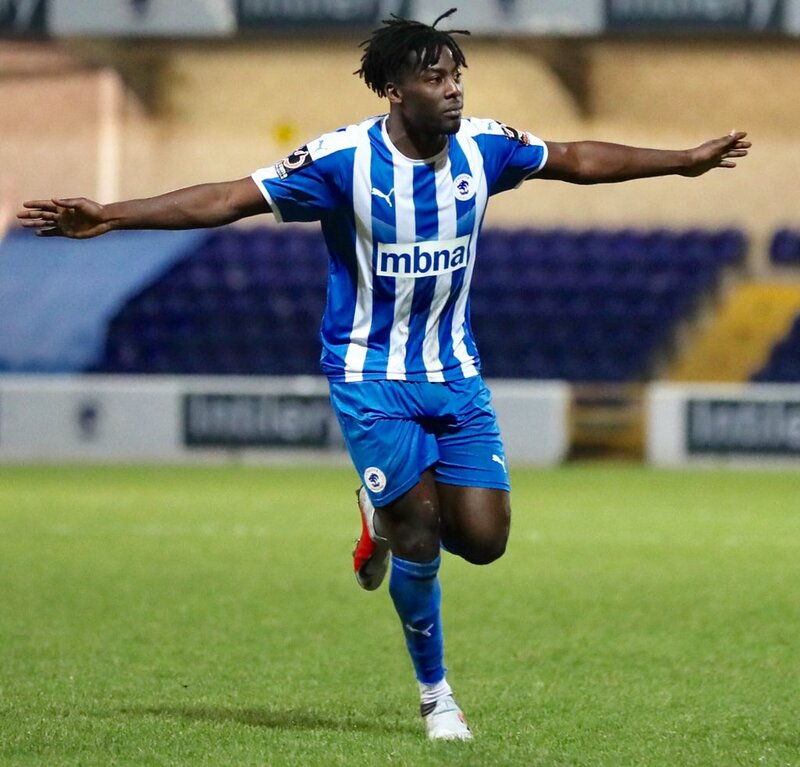 Chester FC secured a vital three points, lifting them to third in the National League North, following the perfect hat-trick from debutant Akwasi Asante. A thumping header, an outstanding turn and cool left-footed finish for the second before a thunderbolt off the right boot for his third saw the Blues run out 3-1 winners over the North East side. Chester made three changes to the side that lost 2-0 to Southport during the week, Cain Noble, Craig Mahon and new signing Akwasi Asante all came in, replacing Gary Roberts, Adam Dawson and Luke Jordan. It was the hosts who settled the quicker and created the opening chance of the game as Dan Mooney’s corner was headed down by Danny Livesey to Craig Mahon on the edge of the penalty area. The tricky Irishman burst into the penalty area before his effort was deflected behind for another corner. Mahon again was involved for the Blues as they went forward, cutting in from the left side before firing right footed, but Jonathan Maddison was equal to it. Darlington were playing the ball out from the back and moving it around well, but found chances at a premium, so when Chester dispossessed them in their own half and broke at pace it had the visitors on the back foot. Stopforth’s pass to Mooney lead to the on-loan Fleetwood winger cutting in onto his left foot and firing a curling effort wide of the post. Midway through the first half and it was the home side who were still looking the more likely to score, and again it was Craig Mahon who came closest. The Irishman’s tricky footwork saws him escape the attentions of three Darlington players on the edge of the penalty area before his effort forced Maddison into a good save diving to his left. Just before the half hour mark the Blues deservedly got in front. Akwasi Asante won the ball, cutting inside, before playing it out to Dudley, he rolled it back to Mahon who picked out debutant Asante, who placed his header passed Maddison. The good start for the Blues was soured just after the half hour mark though as Dan Mooney dived into a challenge and was shown a second yellow card, and the Blues were reduced to ten men for the remaining hour. The Blues started the second half brightly, forcing a corner in the opening stages before doubling their lead within four minutes through a bit of magic from Akwasi Asante. The on-loan Tamworth forward produced an outstanding turn to rid himself of two Darlington defenders before producing a cool finish when one-on-one with Maddison. Asante almost completed his hat-trick moments later as he met Mahon’s corner, his downward header had beaten Maddison only to be cleared off the line by Jonathan Burn. The clearance from Burn was made to look even more important within a couple of minutes as Josef Wheatley pulled one back for Darlington with a super twenty-five yard effort that nestled into the back of the net. It was Asante’s day though, as the forward completed the perfect hat-trick. He was down on the halfway line moments before the Blues countered and when Dudley picked him out on the edge of the area he unleashed an unstoppable right footed strike beyond Maddison, sparking scenes of delirium in the stands. Darlington pushed to pull one back and went close as Trotman fired across the face of goal, but it was the Blues’ afternoon. Chester FC: Shenton, Thomson, Grand (c), Noble, Livesey, Howson, Mooney, Stopforth, Asante (Smalley 83), Dudley (Dawson 93), Mahon (Marsh-Hughes 90). Darlington: Maddison, Trotman, Galbraith (O’Hanlon), Elliott, Burn, Hughes, Henshall (Lingthep 92), Wheatley, Saunders, Nicholson, Thompson (c). Goal Scorers: Chester: Asante (27, 49, 69). Darlington: Wheatley (56). Yellow Cards: Chester: Mooney, Mahon. Darlington: Thompson, Elliott. Red Cards: Chester: Mooney (31). Man of the Match: Akwasi Asante.